An explosion on the set of the new Uwe Boll film In the Name of the King 2 has sent six people to the hospital but doesn't appear to be enough to halt production. The explosion took place on the set of In the Name of the King 2 as it was being filmed in Golden Ears Provincial Park, east of Vancouver. Maple Ridge Fire Department Chief Dane Spence said the explosion was apparently caused when a hose came off a propane tank as the film crew was transferring propane into portable cylinders and a nearby heater sparked a "flash fire." Six people suffered minor burns as a result of the incident and one wound up with a broken leg. "What made it a little difficult to diagnose these people is that many of them had black face paint on and medieval-type clothing from the movie set," Spence said. The RCMP and WorkSafeBC are investigating the accident. 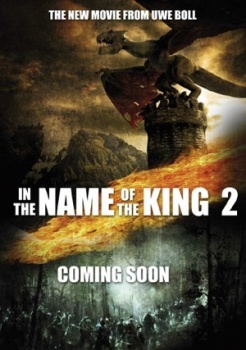 It's fortunate that nobody was seriously injured, but the downside is that the accident won't be sufficient to bring a halt to production of the sequel to In the Name of the King: A Dungeon Siege Tale, the 2008 flick that helped earn Boll a Golden Raspberry Award for Worst Director. The new film, starring action legend Dolph Lundgren, is entitled simply In the Name of the King 2; no release date has been set.